the first affordable device on the market capable of streaming multichannel 384 kHz and 352.8 kHz DXD in full 32 bit resolution from a PC to a DAC with professional mastering quality. exaU2I will work with most DIY DAC boards with I2S input. 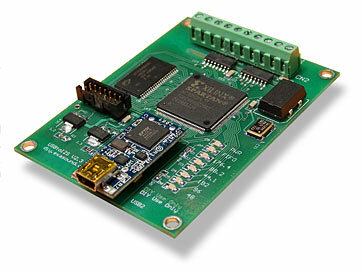 We tested and perfected our design using a DAC based on the ESS Technology ES9018 Sabre32 Reference chip. exaU2I is the missing link between a PC and the I2S input of your DAC. It is designed for use in high-end DIY audio projects aiming to achieve sonic performance that rivals traditional audiophile grade gear. The ASIO driver provides automatic sampling rate switching and bit-perfect data transfer. Galvanic isolation of the I2S output from the FPGA core and the USB ground virtually eliminates jitter and common noise originated by the PC. exaU2I USB to I2S Interface is the missing link between a PC and the I2S input of your DAC. exaDevices USB to I2S Interface is designed for use in high-end DIY audio projects aiming to achieve sonic performance that rivals traditional audiophile grade gear. exaU2I is the first affordable device on the market that makes it possible to stream multichannel 384 kHz and 352.8 kHz DXD audio in full 32 bit resolution from a PC to a DAC with professional mastering quality.